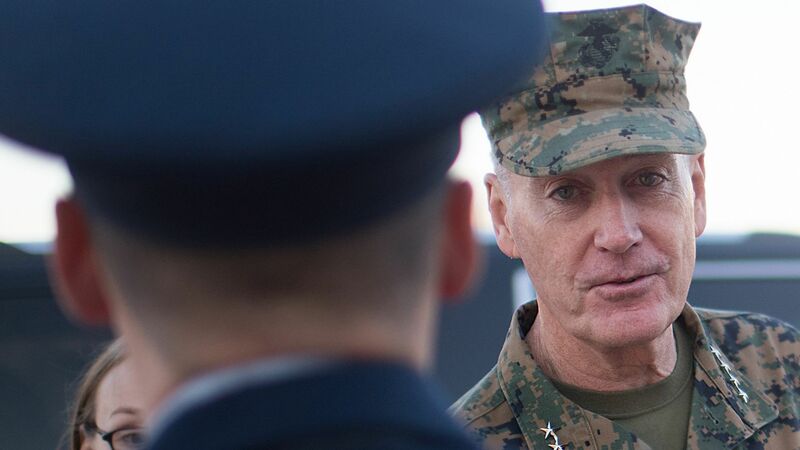 HALIFAX, Nova Scotia — Gen. Joseph Dunford, chairman of the U.S. Joint Chiefs of Staff, is unhappy with the readiness of Big Tech to produce products for China while many company employees insist on not working with the U.S. military. Details: Dunford, speaking in Halifax on Saturday, said that the American military needs the help of Big Tech companies to master artificial intelligence, which he said will lead to a battlefield advantage. But his remarks suggested that he continues to find resistance in Silicon Valley in helping the military get there. "This is not about doing something that's unethical, illegal or immoral. This is about ensuring that we collectively can defend the values for which we stand." The big picture: In June, Google pulled back from a Pentagon program called Project Maven after a massive protest by its employees, but it said it will not rule out future work with the military. Google has meanwhile defended plans to produce a censored search engine for the Chinese market. In October, Microsoft employees wrote a letter opposing company plans to bid on military projects. But Microsoft — and separately Amazon and Oracle — said they would continue to work with the Pentagon. The bottom line: Notwithstanding the company statements, Dunford's remarks suggest that he is not seeing the action he'd like. "I have a hard time with companies that are working very hard to engage in the market inside China ... then don't want to work with the U.S. military," he said. "I just have a simple expression: 'We are the good guys.'"